Ag tús na n-ochtódaí, bhí coincheap na Gaelscolaíochta ag dul i bhfeidhm go mór ar an bpobal. Athbhunaíodh craobh de Chonradh na Gaeilge In Inis sa bhliain 1979 agus bhí tionscnaimh phobail á n-eagrú ag an gcraobh chun an Ghaeilge a chur chun cinn sa bhaile. Bhí an chraobh go mór chun cinn in athbheochan na Gaeilge in Inis agus sa cheantar máguaird. Thug an Conradh ionsparáid don phobal agus d’éirigh leis aird na ndaoine a dhíriú ar an nGaeilge. Go deimhin bhí an cúltur gaelach go láidir in Inis cheana féin agus ba chainteoirí Gaeilge iad roinnt mhaith de mhuintir na hInse. De réir a chéile, bhí ag éirí leis aird an phobail á dhíriú ar an nGaeilge. Bhí go leor daoine sa bhaile a labhair Gaeilge agus bhí traidisiún láidir Gaeilge ann. I 1981, beartaíodh comóradh a eagrú chun bunú Irisleabhar na Gaedhilge in 1882 ag Mícheál Cíosóg a cheiliúradh. Reachtáileadh an comóradh i Mí na Samhna 1982 le deireadh seachtaine de imeachtaí ar an gCarn, áit dhúchaís Chíosóig, agus in Inis. D’fhreastail Uachtarán na hÉireann, An Dr. Pádraig Ó hIrghile ar an gComóradh, áit ar labhair sé go poiblí faoin nGaeilge. Dúirt sé “Tá rud marfach, uaigneach ag baint le bás teanga. Ná bíodh sé le rá fúinne, an ghlúin, seo, gur muidne a bhí ciontach as briseadh do-leighiste i slabhra na teanga. Is breá é an comóradh seo le leac cuimhneacháin ach is gá gníomh beo do shlánú teanga”. Ós rud é go raibh an méid sin díospóireachta faoin nGaelscolaíocht ag an am, tháinig grúpa tuismitheorií chuig Conradh na Gaeilge in Inis chun feachtas a thosú le bunscoil LánGhaeilge a bhunú sa bhaile. Bunaíodh coiste le Roibeárd Ó Ceallaigh mar Chathaoirleach agus tosaíodh ar an bhfeachtas earcaíochta chun an uimhir chuí de pháistí a fháil chun an scoil a bhunú. Chuir Comhaltas Ceoltóirí Eireann seomraí ar fáil i gCois na hAbhna agus ceapadh Domhnall Ó Loingsigh mar chéad Phríomh Oide ar an scoil nua, a ainmníodh i gCuimhne ar Mhícheál Cíosóg. D’oscail doirse na scoile den chéad uair ar an 2ú Meán Fomhair 1983. Bhí Roibeárd Ó Ceallaigh mar Chathaoirleach ar an gcéad Bhord Bainistíochta, Domhnall Ó Loingsigh mar Rúnaí, Máirtín Ó Dubháin mar Chisteoir, agus Pádraig Mac Mathúna, Áine Ní Dhrisceoil, Máire Ní Mhaoileoin agus an tAthair Séamus O Maoláin mar bhaill. Bhí aon scoláire déag i láthair nuair a cuireadh tús le ranganna ach de réir a chéile d’fhás an scoil agus sa dara bliain fostaíodh an dara múinteoir, Eithne Ní Dhonaile. 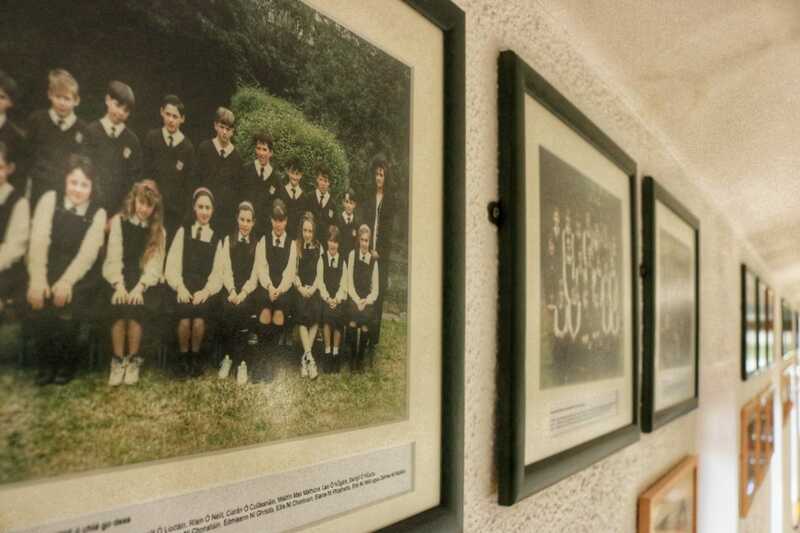 Faoin mbliain 1986 bhí ar an scoil bogadh isteach i seomraí réamh-dhéanta a bhí tógtha ar shuíomh a chuir Comhairle Contae an Chláir ar fáil. Lean an Ghaescoil ag fás agus tosaíodh ar fheachtas chun buanfhoirgneamh a chur ar fáil ar shuíomh nua, áit a bhfuil an scoil suite ó shin..
Bhog Gaelscoil Mhíchíl Cíosóg isteach sa scoil nua i nGleann Aibhne i 1998. Ceapadh Máirín Uí Dhuinneacha mar phríomhoide i 1998 freisin. 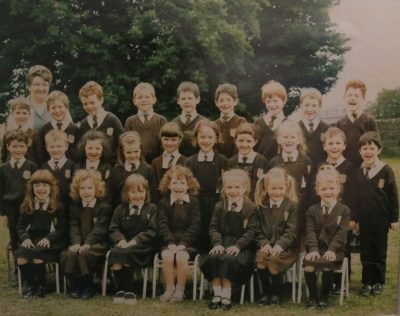 Tháinig Dónal Ó hAiniféin mar phríomhoide chuig Gaelscoil Mhíchíl Cíosóg i 2006. 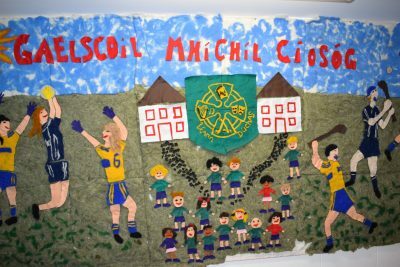 Cuireadh clós nua agus roinnt seomraí breise leis an scoil i 2009. Bhí 243 dalta ar na rollaí i Meán Fómhair 2010. Tá 462 ar na rollaí ó MF 2017. 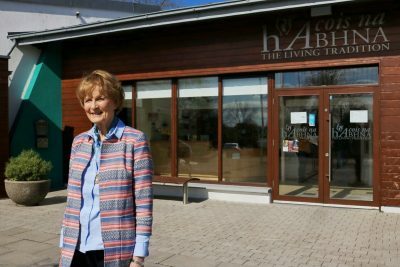 Tá Naíonra Céimeanna Beaga ceangailte leis an scoil agus bíonn seisiún maidine agus seisiún tráthnóna sa Naíonra a bhí faoi stiúr Áine Uí Dhrisceoil ó 1983 agus atá á stiúradh ag Katie Uí Chaoimh le blianta beaga anuas.